With our country having been victim to several shootings in recent history, one local school put in some effort this weekend to prepare themselves for such an event. 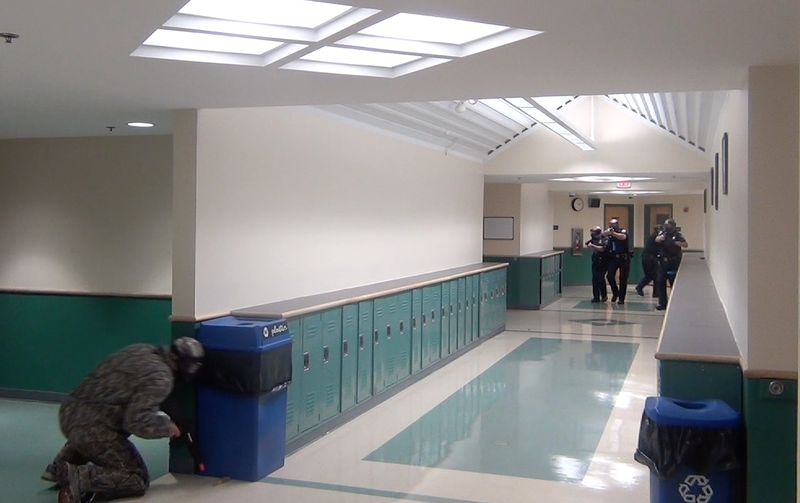 On Saturday morning, the Sunapee Police Department, with help from Homeland Security and the Sunapee School District, held an Active Shooter Drill at the Sunapee Middle High School. Sunapee Police Chief David Cahill began planning this drill months ago which involved the officers from the Sunapee Police Department, volunteer students, teachers, administrators, and staff from the school, as well as New London dispatch. The scenario for the drill was a man with a rifle, played by New London Police Chief Edward Anderson, whose plan was to gain access to the school and try and enter a classroom. Teachers would then call 911 and police would arrive and confront the gunman. Chief Cahill and others spoke with those involved before the drill on what to expect and how they may feel during the exercise. He stressed that safety of all the participants was the top priority. After the event, which took about 20 minutes to complete, there was a discussion to talk about what went right and what could be improved on such as communication and keeping people from harm during an event like the one staged.